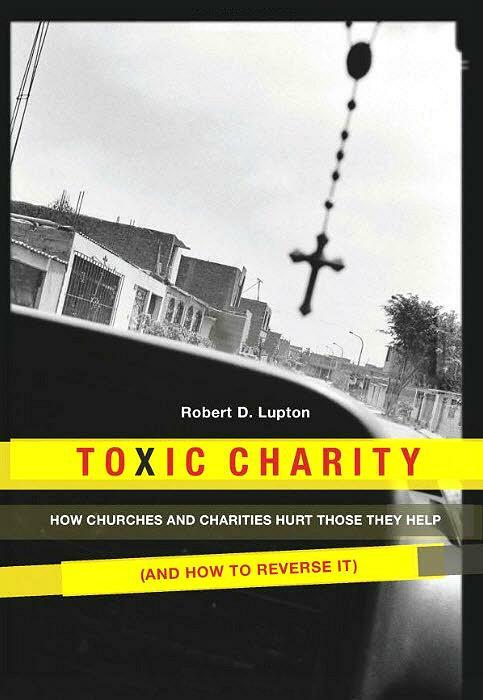 Robert D. Lupton, Toxic Charity: How Churches and Charities Hurt Those They Help (and How to Reverse It), New York: HarperOne, 2011, 191 pp. I had been both intrigued and nervous about this book since it came out a few years ago. I have long wondered how many social service agencies and charities are in the business of eliminating hunger, poverty and injustice versus how many are in the business of making good business–which means securing and even increasing the number of people eligible for services, therefore growing their organization and its importance. Likewise, I share with Lupton a skepticism about how much church volunteerism serves the needs of church do-gooders versus how much it serves the needs of those supposedly being served. However, I am leery of those (generally right-leaning, Republican) thinkers who believe that all aid creates freeloaders and therefore we should eliminate all social programs, effectively punishing people who are poor or in crisis. I worried that Lupton would fall into that category, or at least support those arguments. I was hopeful that he would offer a scathing analysis of the injustice of our current economic system, including our reliance on charity for our social support system. I was fearful that he would ignore systemic injustice and insist that poverty was caused by entitlement and laziness. Toxic Charity split the difference between my hope and my fear about it. Lupton does not blame poor people for their plight, or make claims that they should be abandoned to their own problems or “pull themselves up by their bootstraps.” He acknowledges the injustice of major barriers like low wages, zones of urban blight and lack of childcare. He dismantles all our charitable endeavors and analyzes the culture of dependence they create, the submission they demand, and the way they often create more problems than they solve. This was excellent. However, the solutions he offers are all embedded in the same capitalist economic system that created the problems in the first place. Creating jobs and economic opportunity is a good thing, and I applaud Lupton’s work and writing–but I desperately wanted him to take it one more step and label our current economic system as unjust, to name the reality that capitalism depends on cheap labor and extracting value from some to send it to others. Instead, he rests with efforts to help people succeed in the system as it currently exists. The greatest strength of Toxic Charity is its absolute take-down of our current system of charity. Lupton argues, convincingly, that few charitable institutions actually help solve the problems they were created to correct. Instead, they tend to perpetuate them or even make them worse. He criticizes this from a business and stewardship perspective, but more from the perspective of healthy relationships. Healthy relationships require some equality between partners. Our current charitable endeavors encourage exactly the opposite–an ongoing pattern of giver and receiver, which means those relationships quickly become toxic for both parties. His analysis extends especially deeply and well into short-term mission projects undertaken by churches. Whether it’s a day spent in a nearby inner city neighborhood, or an expensive trip overseas to build some needed house or well in a foreign country, Lupton names the reality that these journeys are far more about the needs and feelings of the givers than the receivers. They foster a culture of dependence, remove economic development opportunities from local economies, and waste millions of dollars on unnecessary travel to bring people with no expertise to do a job they are less equipped to handle than the local population. So why do we do it? What Lupton says: because it makes us feel good. What I want Lupton to go on to say: Because it makes us feel better about our own wealth. Because it helps us sleep at night. Because it relieves our guilt about benefiting from a system that is destroying others. Limit one-way giving to emergency situations. Strive to empower the poor through employment, lending and investing, using grants sparingly to reinforce achievements. Subordinate self-interests to the needs of those being served. Listen closely to those you seek to help, especially to what is not being said–unspoken feelings may contain essential clues to effective service. Lupton’s book, even though I wish it had gone farther and been more critical of capitalism and injustice, should be required reading for non-profit boards and directors, church pastors and mission boards, and philanthropists of all kinds. Oh, dear God, the Oklahoma tornadoes. Such heartbreak. Christ, have mercy. On March 2, 2012, forecasters anticipated tornadoes in our area. My son’s school let out early, and when the sirens started up we all huddled in the unfinished basement. The air outside our windows was deadly still, but the internet broadcast from our local television station told us that a large tornado was on the ground just a few miles away. We waited underground in folding chairs, my husband reading a book and my young son playing a video game. I kept my eyes on the screen as reports began to come in about damage in small communities populated by beloved church members and friends. Then the image changed: a school collapsed, no knowledge of how many students might be trapped inside. My stomach lurched, and I thought I might vomit. I silently ticked off a list of all the young people I knew inside that school, their young lives and fears flashing before me. I grabbed the laptop and slammed it shut—presumably to protect my son from frightening news, but probably also because I could feel the panic overtaking me. Since the storm, I have relived that terrifying moment awake and in dreams. As soon as the sirens stopped, I began to call for news, and passed several anxious hours with families waiting to hear if all were safe and well. 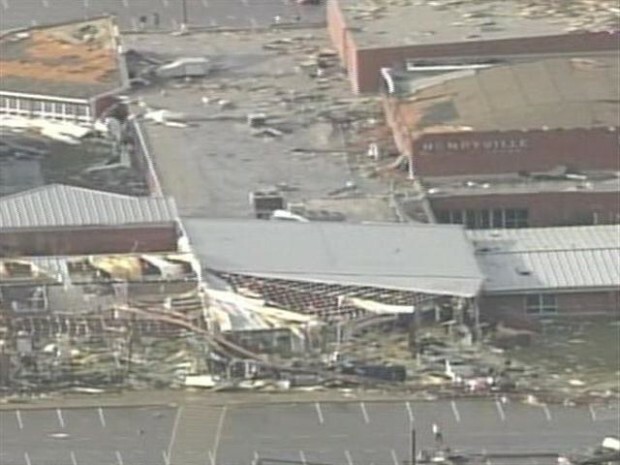 Miraculously, no lives were lost at Henryville school that day, although children and adults did die in their homes as a result of the storm. Today in Moore, Oklahoma, the story has a more grim ending. I know how traumatic the tornado was here, but I can only imagine how that distress is multiplied tonight in Oklahoma. My heart breaks for parents who have lost children, children who have lost parents, and a community gripped by shock and grief. The recovery ahead will be measured in months and years, not days and hours. I have spent the last fourteen months working nearly every day on recovery efforts here in my community, a disaster much smaller in scale than tonight’s news from Moore and the surrounding areas. I am currently the chair of March 2 Recovery, the long-term recovery organization working to rebuild homes, address unmet needs and tend to the spiritual and emotional needs of our community. I’m not an expert, but I have learned some things worth sharing. All compassionate people want to respond, to help, to do something in response to tragedy. This impulse is good, because the people of Moore, Oklahoma will require outside aid, volunteers and resources to help them in their recovery. However, many well-meaning people and organizations give “help” that is far less than helpful, and may actually be harmful to the recovery process. I went looking tonight for a list of “do’s and don’t’s” for how to help after a disaster, but I didn’t find any lists that were more specific than “send cash, not stuff.” So I made my own. As one who has worked closely with tornado recovery efforts in the last 14 months, I would like to offer these DO’s and DON’T’s, so that you can help in ways that are the most helpful, and avoid the ways that are not. DO NOT send “stuff,” unless you specifically know it is wanted, needed and has a clear destination. The avalanche of used clothing, toiletries, canned goods, furniture and household supplies that pours in after a disaster can become a “secondary disaster” for a community, as organizations are forced to set aside the actual needs of survivors in order to attend to the mountains of stuff arriving at their doorstep. People who have lost their homes won’t need household goods and furniture for many months, and don’t have anywhere to cook your can of Campbell’s Chicken Noodle. DO NOT drive to the impacted area to help unless you are trained and credentialed by a recognized organization. Not only is the tornado debris field dangerous, the crowds of onlookers and unskilled volunteers get in the way of trained relief workers trying to do their work. DO NOT say dumb things like “I know what you are going through,” because you don’t. Only if you’ve lost a child or lived through a disaster do you have some first-hand knowledge about what someone is feeling. Even then, be cautious. Not everyone will feel the same way you do. It’s doubly presumptuous to say you know what people are feeling if you’ve never even been in a similar situation. DO NOT offer help in order to lessen your feelings of helplessness or make yourself feel better. Put aside your own needs and desires, and act only in the best interests of others. Don’t do what makes you feel better—do what best helps survivors. DO NOT forget about this disaster as soon as another tragedy takes the headlines. Recovery will take a long time. Stick with it. The most helpful people are those who come long after the TV cameras are gone. DO NOT try to theologize disaster away, or say that God did or didn’t do something. God didn’t need more angels, or have any kind of master plan that involved dead children. God didn’t save the children at one school only to harm the children at another one. That’s not how God works. Let God be God, and don’t assign your own motives to the Creator of heaven and earth. DO: Donate money. But not just today. While organizations like Red Cross and Salvation Army do amazing work feeding and sheltering people in the immediate aftermath, they do not rebuild homes or communities. Local leaders and faith-based organizations pick up the work of long-term recovery, and they will need major dollars for construction, case management, survivor support and more. Sure, send $10 via text message today, but wait to mail a check for $100 or $1,000, and send it to groups involved in long-term recovery efforts. Be careful to give to reputable, established organizations only. No matter what your faith or cause, there’s a group for you. DO: Volunteer. But not today, or even in the next month or two. Thousands of people pour in to help in the first few weeks, but the work of rebuilding will last for a year or two. Volunteers, especially those with construction skills, will be needed far more urgently 9-24 months from now to help people get home again. DO: Listen to anyone who needs to tell their story, no matter how many times they need to tell it. Survivors, first responders, clergy and helpers of all types will relive this experience over and over again. It helps to tell and retell it to patient, non-judgmental listeners. Make room for whatever people are feeling—sadness, anger (at appropriate or inappropriate people or institutions), grief, fear, anxiety, even laughter. An example of messages of encouragement: 1,000 paper cranes that travel to places healing from violence, currently at the Old South Church in Boston, the site of the marathon bombings. Click picture for full story. 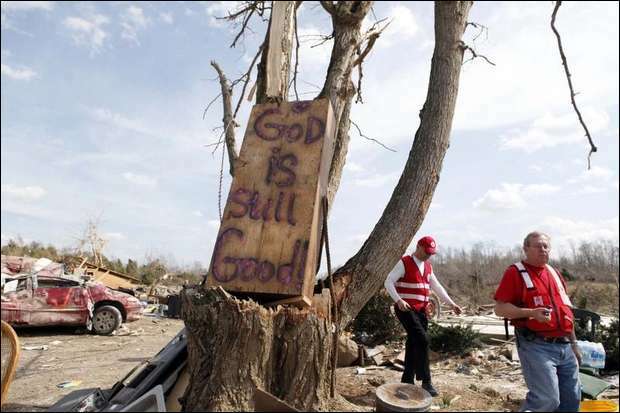 DO: Remind others that God is present even in the midst of destruction. Speak of God’s love that overcomes all barriers, even death. Give people room to have their own relationships with God, even if they’re having a big family fight with God right now. DO: Send messages of love and concern. Whether it’s e-mail, texts, Facebook posts, tweets, letters, cards, notes, banners or children’s drawings, your words can be a source of great encouragement. Send them to local churches through your denomination. Mail them to the fire station or hospital or police station to encourage the helpers who are working 24-7 to aid their community. Share messages with people in the affected area who share your profession, whether it be insurance agents, funeral directors, electricians, servers or retail workers. Indicate that you do not expect a response, but merely send your love and prayers. It will be appreciated. DO: Pray. It seems like such a small thing, but it matters. We could feel the prayers from around the world bearing us up and giving us strength. There you have it. That’s what I’ve learned in the last year about life after a disaster—how your help can be most helpful. I’m sure I’ve left things out, and will count on you to add them in the comments section. This is my small way of helping, through communication about what’s actually helpful. My heartfelt prayers are with the people of Oklahoma, now and in the long months to come.